This is the best shampoo I have found. It is the only product that makes my hair look amazing and look glossy. Worth every penny! 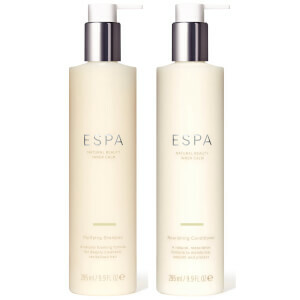 I tried this product first at ESPA Riga and had several mini-versions before having this one. This is a perfect way to have a small spa experience while taking a simple shower. Smell is great, as always. I have normal type colored hair and with this shampoo it gets greasy a bit earlier than usual, I guess the product it really reach, so I cannot use it regularly. But once a week it is perfectly fine, leaving hair soft and nice to the touch. They smell great, have no harsh chemicals and keep my hair frizz free and shinny . Lovely smell when washing hair. I use the conditioner too. Hair feels lovely and soft. Love the smell. My hair feels really cleansed.